Last week, I was invited to a high school as an ‘expert’ on using Moodle in the classroom. I had a series of 45-minute sessions to, as my brief read, ‘inspire’ each group of teachers (average size of about 15-20) over two days of PD to use their nice local Moodle & Mahara setup in their teaching. I’ve never liked ‘gurus’ showing flashy wares and ideas, especially right at the start of school year with so many things to get ready before the kids arrive. I’ve never liked being considered one either. So, I thought we’d use the 45 minutes for a guided chat about things we are kinda all good at – talking about our needs. Needs of teachers I spoke to and, importantly, the kids they teach. In the context, shoot a few Moodle ideas past them and see how use-full or use-less they may be. 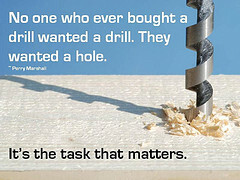 But it was about the hole, less about the drill. EVERY group sat a little stunned at first. Believe it or not, the ideas did not flow very freely. The replies ranged from encouraging (‘enthusiasm’, ‘motivation’, ‘meaning’ …) to downright pathetic (‘textbook’, ‘ways to easily memorise a range of acronyms we use’). We’d eventually get about 5 – 10 needs on the board to work with. And behold the question “Why DO you teach?” asked as the conversations began to flow. Many felt a little threatened even! Or as one teacher put it: “Nobody really gets asked these questions.” Rarely, if ever, do teachers ask these themselves. It’s all assumed, we all know what happens at school and what the school and teachers are there for, we all ‘innovate’ but it basically changes bugger all while giving the impression of progress and change. 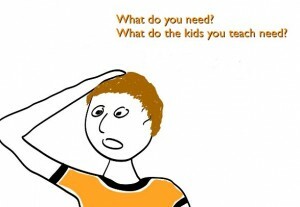 I am NOT bashing teachers here. Quite contrary, I understand so many of them, barraged by things to, often mindlessly, tick and do while lacking time, space, even increasingly a reason for these questions (other than stuff like ‘raise scores’ etc.). While I did cover my brief and talked about Moodle and ‘technology’ over the two days, I was glad, while sad and often a little horrified, to talk about the ultimate technology and weapon for change – asking good questions and wrestling with them. I wish all my Australian & New Zealand teaching colleagues and their students a great school year 2011 (first day today for most). Turn the crap detectors on and use them! Make it matter. And if you think I can help you in some way in doing that, you know where to find me.